A few months back I wrote about $10,000 in shares that my employer would be paying me out as part of the separation of my employment. This past week, that cheque finally arrived! The consensus on that post was to keep the cash liquid until things settled down with the sale of our house, new baby, my future job prospects etc. The decision I had to make was the best way to convert the cheque which was issued in USD to Canadian dollars. The exchange rate is around 1.35, but most institutions charge some sort of fee. I was going to write a post humming and hawing about if I should contact other institutions or just go with Tangerine. I had spent thirty minutes on the phone just getting these rates - which doesn't sound like a long time, but really felt like it because Little Man was crying and fussing the whole time. I'm not going to write that post, or ask for that advise. I decided to just deposit the cheque with Tangerine. I have to mail it because there are no Scotia ATMs where I live, and you can't use the cheque in feature with USD cheques. Sometimes, you just have to do what works - and this time, with the level of sleep depravation I'm dealing with, this worked. Little Man has started rolling over from tummy to back, and he's made it half way from back to tummy. So far when I have wanted to give him space to play and learn and develop his muscles we have done so on a yoga mat on the floor with me siting with him. We have three dogs in the house, and while they have all been respectfully curious of him, I'm also not going to leave him alone to get run over when they start playing. That said, it would be nice to be able to get up once in a while and get dishes done, or supper started with both hands. 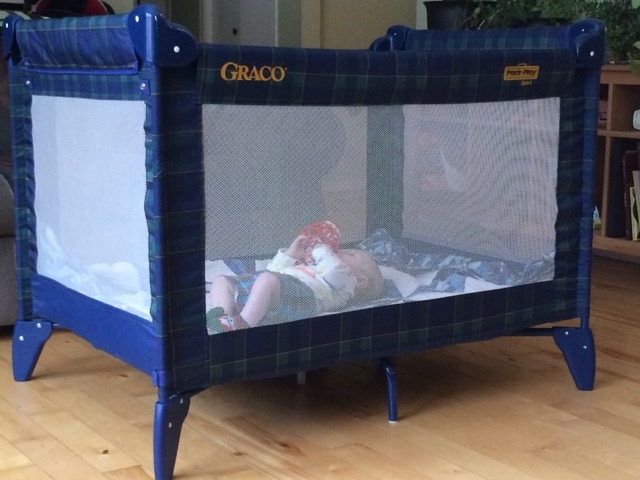 So, we thought that a playpen would do the trick. We still have money in the baby fund, but rather than jump the gun and purchase something new right away, I thought I would post in our towns local Facebook classifieds group. Within an hour, I had three offers that ranged from free to $100 - so naturally I checked out the free option. I was a bit sceptical at first, but it turns out that was for naught. The playpen is perfect! And Little Man seems to think it's pretty good too. I just folded one of my quilts and laid it on the bottom along with some toys, and he's happy for a solid 20 minutes without being in my arms. Woohoo! Five years ago or so, when Jordan and I merged our finances and decided to manage our spending with a joint day-to-day spending account that was different from our joint workhorse bill-payment account we decided that each Friday would be payday. On that payday, we would buy gas and groceries FIRST. Then we could spend on other things likes clothes, entertainment, eating out, etc. That worked for a number of years, and as we got comfortable with this new money management routine, we got lax on these rules we gave for ourselves. This past year has had so many changes, living apart for six months, getting pregnant and having Little Man, selling our house and moving - that we've fallen off the wagon a bit - as seen by going over budget by $250 last month. I was chatting with my mom a bit about it, and I think she thought - and perhaps some of you - that we were putting eating out (for example) all on credit before paying it off. But that's not the case. What's been happening, is by the end of the week when we were running out of cash in the day-to-day, we would wind up using credit (then paying it off), and going over budget by spending on gas/groceries at the END of the week instead of the START. So! We're going to go back to spending how we did when we first started. Gas, and groceries first. Starting on this coming Friday, we'll make sure we've got the groceries list and fuel up all the vehicles. Hopefully, getting back to this strategy will help us get back on track. Has anyone heard of these guys yet? EQ Bank is a branch of Equitable Bank that has been around for some time in Canada. It has been a mortgage lending facility and through the EQ branch will now be offering an online only savings account with only online access (no debit cards). So much the way that ING (now Tangerine) started out in Canada, with plans to have increased offerings as time goes on. They are giving five free interact transfers, and unlimited day to day (bill paying) transactions. So their could be delays in accessing your cash due to these restrictions, and the restrictions of each transfer. They are offering 3% interest for all accounts. This is apparently not an introductory offer, though like all banks they reserve there right to change the interest rate at any time....so it's their opening offer, who knows where it'll wind up as new accounts get opened. So far online forums, and direct feedback on their Facebook page would indicate they have been overwhelmed with new account openings and their customer support isn't able to keep up. Again, that's much like ING when they started out, and even Tangerine had hiccups after ING was bought by Scotia Bank in Canada. So I'm super interested to know if anyone is planning on opening an account to stash some cash and capitalize on the 3% for as long as it's offered. I'm thinking about it, especially with the proceeds from the sale of our home. It could make a difference for sure. 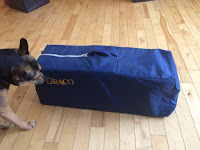 Well, the insurance was due for the Escape - for a grand total of $1,183. That's a couple hundred less then the Kia. So annually, for both vehicles it's a grand total of $2,529. So we need to be saving at least $210/month to be able to do the lump sum next year. I had guessed about $250 before we had all the totals, so not too shabby. 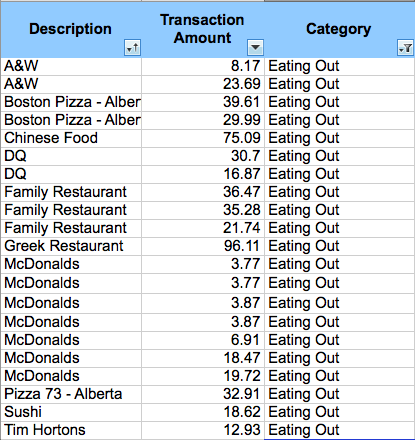 In January we ate out 21 times. Yup, 21 times. 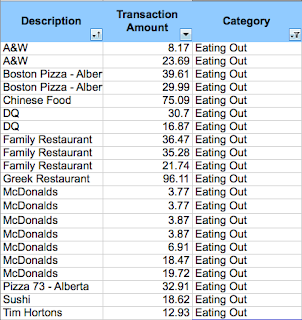 We spent just about $540 in restaurants and fast food joints. Yuck. I felt like, it might help to do this left often, if I put the details out there, rather than just skipping over it in our monthly spend report posts. We ate out three times when we were in Alberta - those I'm happy with. The Tim Horton's run was also on a trip into Alberta. We picked up the tab for us and my mom at the Chinese Food place, and one of the Family Restaurant trips was just me and my mom. The Greek Restaurant was me, Jordan and picking up the tab for my uncle who was helping us evaluate a home that needed a lot of renovations. The McDonalds and A&W are mostly Jordan grading lunch and/or a breakfast sandwich (I think). The couple of times when it was closer to $20 - he grabbed something for me too because I hadn't had a chance to feed myself with Little Man always napping on my lap. So, I'm not going to say that we're never going to eat out - that's just not realistic. For the month of February especially, we have several more trips to Alberta to get our stuffed packed and while we cook as much as we can, we're inevitably going to eat out some, and feed whoever helps us. BUT...I think we have some progress to make in Jordan's lunch/breakfast trips and in the family restaurants for sure. I don't know what a reasonable goal is - perhaps cutting the total spending in half because we went over budget in the day-to-day spending by about $250. I know some people go the extreme all-or-nothing route, but I don't think that will work for us. Maybe if Jordan picks up lunch/breakfast once a week, and we buy dinner out no more than twice a month? What do you guys think? 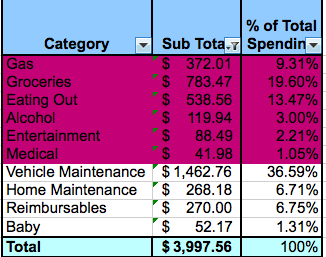 Here we go, January's spend summary. The categories highlighted in pink, are all in the day-to-day spending category that we budget $425/week for. So for January we were over budget by about $244. We did go to Alberta twice if I'm remembering correctly, and it's hard not to eat out some when we do that, but we did make most meals at the house even though just about everything is packed. Gas is pretty reasonable considering all the driving - but of course, gas in Alberta is pretty cheap right now (not where we are in BC though - it's about a 30 cent difference). Entertainment includes our Netflix subscription, a few lettery tickets (Jordan), and what I'm assuming are a few slurpies and other quick-grab snacks at 7-11 from Jordan. 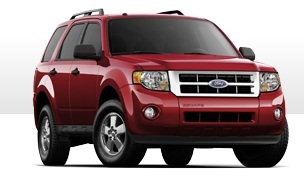 We had a few vehicle items in January, including renewing the insurance for the Kia which we paid for in a lump sum. Home Maintenance included a $90 trip to Home Depot (can't remember what that was for, so I'm guessing Jordan went there), a $50 trip to the source (Jordan got a dongle for the TV to watch Shomi), and $35 at Walmart. Reimbursable's include all my trips to physio this past month, and a few odds and ends for Little Man. It's really the last month where we can go over budget an we still have my income to cover it. We're now just on EI, and need to get closer to not over spending. Which us luck for February....where we have four trips to Alberta planned. ...or Wine as the case may be. 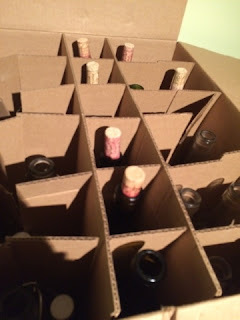 We unpacked a load from my mom's small utility trailer earlier this week, and found a box that had some of my home made wine in it....It had frozen, and then thawed and the corks had popped. Thankfully it wasn't a full case, and the bottles are still intact. So Jordan, under some duress did a taste test. So far, the first sip is better then expected. Okay, so now that we're down to just EI and Jordan's salary, it feels like a good time to post the budget we're working with. Now, this doesn't apply for February because we still have the Mortgage and the Line of Credit, and all the expenses (utilities, taxes) associated with having the house in Alberta. Once the house clears, we're going to be clearing those debts and eliminating those expenses, so this budget is for March going forward until we find a new home. 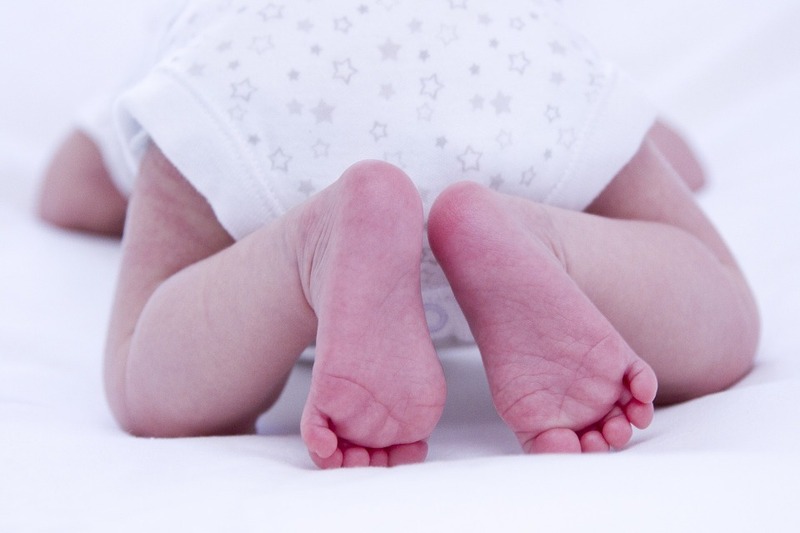 Some things that will be changing soon are insurances. We're currently looking at Life Insurance for both of us, and we'll also need to look at tennants insurance of some kind to protect our belongings that are in storage. I've left line items for those, but the numbers are blank for now. 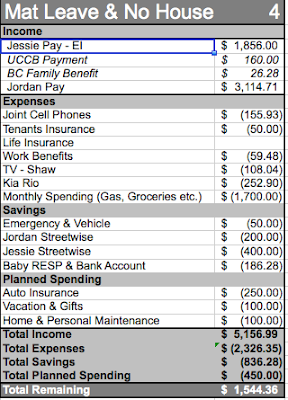 You might have read on previous posts that I was eligible for the maximum EI and that we also are receiving USSB and BC child care benefits, so that plus Jordan's scary makes up our monthly income. Next we have our cell phones and the unknown insurances. Following that we have the benefit premiums I'm paying to maintain my benefits through work. These used to be deducted from my pay - health care is paid for 100%, but this is 50% of the dental care premium, and Long Term Disability Insurance. We're paying for TV at my mom's place which is the next line item. Following that is the car payment - which is paid bi-weekly. We owe around $14K on this still, so have a ways to go and it is at 0% financing. I often refer to our monthly spending as 'day-to-day' - this is the money allocated for gas, groceries, hair, clothes, EVERYTHING that is not a fixed expense. I did a post for leaving this as is a little while ago - but we'll keep evaluating as time goes on. The savings and planned spending are relatively low considering the amount left over at the end of the month ($1,500) - which is part of the point of this post, to figure out what to do with it. I feel like it would be good to boost RRSP for a while, and important to always tuck away a little bit for emergencies. The Baby RESP gets $100/month and the Baby bank account gets the $86.28. I want to have some money in his bank account for 'long term savings' for him to learn about when he's older, but we may also use some money from here at the end of each year to top up his RESP - we shall see. 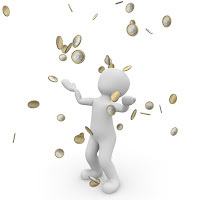 We pay for auto insurance in BC annually, so the $250 is to set aside for each year. Then of course vacation, gifts, and maintenance. This is more personal, than home right now, because we won't have a home of our own for a while - but this is for basically everything that we would need from home depot for house maintenance (yard supplies, shingles, money for big house stuff like when a furnace quits etc.). Personal Maintenance is things like hair cuts, work boots etc. If we need a 'top up' from the day-to-day. Okay....so. The only debt we have is the Kia which I'm inclined to pay off with the rest of the $1,500 each month BUT with planning to buy a house, it might make more sense to just stash all the extra cash for a bigger downpayment, bigger emergency fund - that sort of thing. What do you think? Keep the cash, or pay off the Kia? How did 15 weeks go by already? Back in October, when I was waiting for Little Man to arrive, I mentioned that one of my benefits was a salary top up. When on an eligible maternity leave, and approved for Employment Insurance, my employer tops up a mom's EI benefit to 70% of their salary for 15 weeks. The idea is to help transition the family from regular salary, down to EI with a 'step'. It's a huge help! 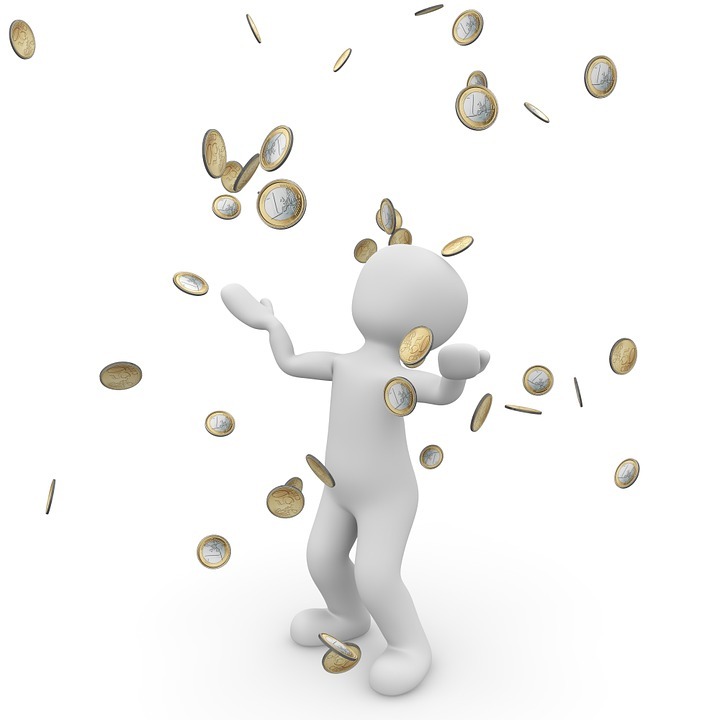 Normally, the employee must return to work for a minimum of six months after the leave or the benefit must be repaid. In my case, I don't, because just before my Maternity Leave started, I was laid off. As part of my termination package, I do not have to repay the benefit. Not Little Man, but Super Cute! The last Friday in January marked the end of my top up. So going forward, it's just EI. eek! Good thing the house has sold so we will only have a mortgage payment for the month of February, well, until we buy our new home that is. Today would have been my dad's sixty second birthday if Lung Cancer hadn't taken him away from us almost four years ago. We had gotten the confirmation weeks after my husband and I were married and just a few months later, he was gone. I think about him so often, especially now that we have Little Man. He was so ready for grandchildren and it breaks my heart that he didn't get the chance to meet his first grandson. So today, instead of thinking about, or writing about money, I'm just going to spend time with my family.